Hollywood lost yet another gem when Carrie Fisher passed away. The Star Wars actress died at the age of 60, after suffering cardiac arrest on a flight. 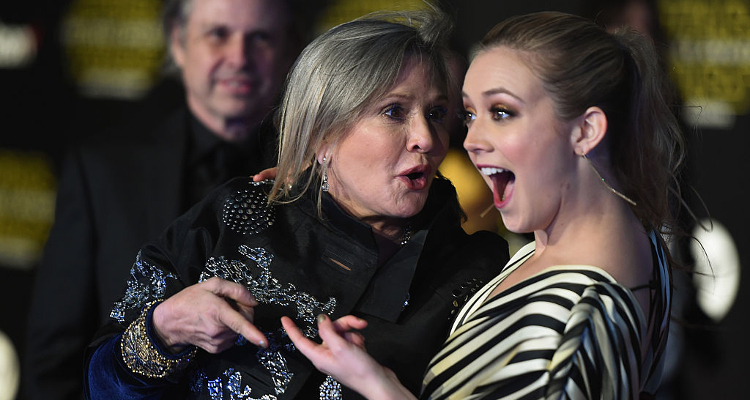 Here are four facts to know about Carrie Fisher’s daughter, Billie Lourd. Tragedy strikes again after the death of singer George Michael on Christmas Day. Legendary actress, Carrie Fisher, best-known for her iconic portrayal of Princess Leia in the Star Wars franchise, passed away on Tuesday (December 27) in Los Angeles. The 60-year-old actress went into cardiac arrest while traveling on a transatlantic flight, four days prior to her death. Carrie Fisher’s daughter, Billie Lourd, has inherited her mother’s acting chops and is a talented actress herself. The 24-year-old is well-known for her role as Chanel #3 in Fox’s horror comedy, Scream Queens. Here are four interesting tidbits to know about Billie Catherine Lourd. The youngster might be in her early twenties, but she is already rising in the Hollywood ranks. Lourd has proved that she is not just her mother’s daughter, and is more than just a pretty face. Born on July 17, 1992 in L.A., Lourd was raised in the lap of Hollywood luxury with her grandmother being the iconic actress, Debbie Reynolds and her grandfather being famed singer, Eddie Fisher. Billie Lourd’s father is the well-known talent agent, Bryan Lourd. Talk about a star-studded family tree! Lourd made her Hollywood debut after studying religion and psychology at New York University. After graduating in 2014, Lourd signed on to appear in 2015’s Star Wars: The Force Awakens. At first, it was rumored that Lourd, who bears a striking resemblance to her mother, would play the role of a young Princess Leia. However, those speculations were refuted, and it was revealed that Lourd would make a cameo as Lieutenant Connix. Though she did not play a young Princess Leia, Lourd did sport Leia’s classic buns in the film. She has also signed on to appear in Star Wars: Episode VIII, which has a 2017 release date. While her Hollywood career is taking off, the blonde-haired beauty isn’t new to the acting scene. She made her acting debut in Fox’s new horror-comedy, Scream Queens. The hit series premiered to great reviews, thanks to its all-star cast which includes Jamie Lee Curtis, Emma Roberts, Abigail Breslin, and Lea Michele. Billie Lourd plays the role of Chanel #3, a wealthy sorority girl who has trademark ear muffs, as another subtle homage to her mother’s iconic hairstyle in the original Star Wars film. In an interview, Billie Lourd stated that she mistook her initial meeting with Scream Queens creator, Ryan Murphy as an audition, when it was, in fact, a role offer! She confessed, “I thought he wanted me to audition, and so I was just very relaxed and casual about the news. I didn’t think he wanted to hire me; I knew that’s not how things worked. The next day, they told me, you know that offer you didn’t sound too excited about? It’s an offer, not an audition. I flipped out. I didn’t know how he was doing this! The next week I was in New Orleans.” Murphy is also the powerhouse screenwriter, director, and producer of award-winning shows like American Horror Story, The People v. OJ Simpson: American Crime Story, and Glee. Lourd has a movie release lined up for 2017, and can still be seen as Chanel #3 in the second season of Scream Queens. At the end of last year, it was revealed that she was joining the cast of the biographical crime drama, Billionaire Boys Club. Alongside her Scream Queens co-star, Emma Roberts, Lourd will play Rosanna Tickpurth, the love interest of British actor, Jeremy Irvine.